3 rooms of carpet cleaned for $99! Each job is assigned a lead technician with at least 15 years of experience. We are the most experienced truck-mounted carpet steam cleaning business in Utah. We are AAAAA rated on Angie’s list. We are fully insured, certified, and licensed. With 46 years of service, we take the lead in quality, experience, and customer satisfaction. We had them come and clean our carpets and they were on time, very educational and very professional in all that then did! I have had many different companies clean my carpets and tile but I have to admit this company by far does fantastic work and very far priced, I waited for 3 week before writing this review just to see if the carpets are still clean wow I cant tell you how impressed I am, and will refer Doug and his team to all my family and friends. Thank you "A Alpha Cleaning Team". 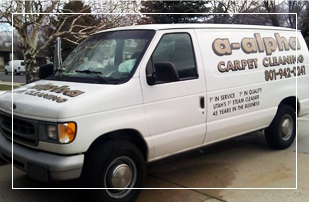 I love having my carpets cleaned, I've used everyone A-Alpha has it figured out, they are passionate about what they do and it shows, they were able to get spots out I didn't think would ever come out, and the heavy traffic areas look brandnew!Another time they came to the rescue!! Running late getting kids off to school and myself to work, kids spilled hot chocolate on my carpet, I didn't have time to even stop and clean it up, called A-Alpha, they sent a guy out same day, took the stress out of an already stressful morning!! An amazing company who I continually use because of their amazing high quality of service for both my home and office! These guys do it right! James and his son JJ did a fantastic job on our tile floor. The grout was really bad, and they came back a couple of times just to make sure they got every bit scrubbed and cleaned. We were very satisfied with their work. I called yesterday hoping to get my carpets cleaned asap. Doug was able to get a crew out within an hour! They did a fabulous job cleaning my carpets and the price was very reasonable! Thank you Doug for the exemplary speedy service! I will recommend this company for all future references! The crew at A-Alpha did a fantastic job on my carpet! They were able to remove stains I never thought would come out, and they were very quick and courteous! Will definitely use them again! A-Alpha really has no competition. I've tried three big name carpet cleaners in the past; One left the carpets wet for a week. Another was a franchise company with T.V. advertising. One of their crews did well, but on a separate occasion a different crew did a poor job. © 2016 A-Alpha Carpet Cleaning. All Rights Reserved.